Today I had the opportunity to sit in on a class with the American Sommelier Association on German and Austrian wines hosted by sommelier, Aldo Sohm. I’m the type of person that learns through repetition so it was a great opportunity for me to reinforce my A ustrian wine knowledge and learn a little more about Germany. 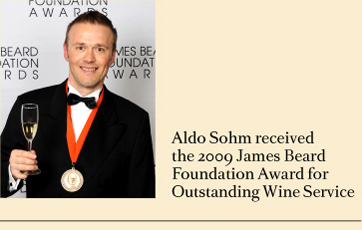 Aldo Sohm has currently earned the title of the “Best Sommelier in the World” through the Worldwide Sommelier Association and has previously been awarded the titles of “Best Sommelier in America” by the American Sommelier Association, “Best Sommelier in New York” by New York Magazine and “Best Sommelier in Austria.” Sohm has also recently received the James Beard Award for Outstanding Wine Service. When he’s not winning “Best of” awards, Sohm is the top sommelier at NYC’s 4 star restaurant, Le Bernardin. A native Austrian, it’s no wonder the ASA asked Sohm to teach the class on Austrian and German wine – he also teaches a class through the ASA on minerality as part of the blind tasting course – Germany and Austria are definitely the perfect regions for that! Sohm gave a detailed look at the classification system for each country, a brief overview of each region and detailed what separates Austria and Germany from each other. As he pointed out, even with the extra half hour he ran over there wasn’t nearly enough time to even scratch the surface of the two countries! Sohm also mentioned that he believes these two regions to be two of the hardest to learn – even more so than Burgundy! Overall, it was a great class – the students seemed engaged and despite the potential language barrier, Sohm presented the material in a way most could easily understand. Over the next few weeks I’ll share some of the highlights of the class so stay tuned!